Could probably also make cookie-sized hamburger patties for her. Meatloaf mixture with cubes of cheese mixed in then pressed into a greased metal cookie cutter could give Selkie that cookie shape. Or mini-bundt cakes. Though the idea of someone serving Selkie a meatloaf cake in the Little Mermaid pan is just fun. Is she OK with cheese? I was thinking getting several sets of stainless steel cookie cutters, butter the hell out of them, and press hamburger into them. Cook them in the cookie cutters and cut them out with a knife. This would prevent them from swelling when cooking. You know, I just might try that myself. Yes. Not a problem for her. In that case, parmesan crisps. And some for me too, thanks. Quite good, actually. A bit misshapen. If you overcook sausage patties, they get crispy and taste great! I call them spicy meat cookies. Gramma’s smile looks really forced. I think she’s really shoving down her feelings for the sake of everyone else. Smiles are something that it’s really difficult to fake. There’s the Duchenne, or genuine, smile, which involves muscles around the eyes that (supposedly) are not in our conscious control — the skin next to your eyes wrinkles. Smiles without this factor are easily picked up on. I learned this from Lie to Me, and studied a bit of Paul Ekman’s work on my own. I’ve learned to fake that fairly well, I picked it up from learning to wiggle my ears and can now control my face and scalp muscles. At some point Amanda (and Andi) are gonna start wondering at her sister’s weird eating habits. “Allergies” is only gonna get you so far. 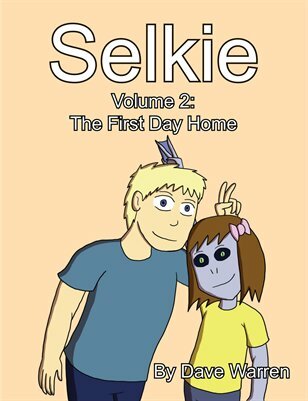 Amanda was Selkie’s roommate at the orphanage. She knows all about her. Yep, this was addressed in comics 326 and 327. Thanks for that. I had spaced those comics. Its so sad that Selkie will never be able to experience the joys of baked goods. Aside from baked meat. I can’t really even think of anything to sweeten the meat with! I mean, just how much sugar can she handle? ALL THE MORE MEAT FOR SELKIE! I’ll take the cookies and the veggies and the bell peppers and ALL THE GRAPES. You know, I recall reading of a study with babies just old enough to stuff food into their own faces that found that, for whatever reason, they seem capable of avoiding stuff that’s not good for them. To the point where one of them who’s allergic to egg yolk dug the egg yolk out of an egg and ate the white only. Or something like that. I know for me, personally peanuts smell and taste absolutely repulsive. Clearly its not something innate to peanuts (like how vomit smells awful to everyone) but a learned/innate association my body makes with something that wants to kill it. My dad is the same with seafood, which he is allergic to. My mom and I do that with artificial sugars, but that’s a trained response. Back when I was a kid, Mom got info on aspartame etc. being bad for you, so we stayed off of ’em, and nowadays, when I taste fake sugar I immediately have a negative reaction to the drink (or occasionally food). It’s kinda like the “ugh” shiver sensation I get when tasting certain types of tomatoes, like there’s just something wrong with the taste. Although in fake sugar’s case, it’s not only wrong, it’s also too sweet. Interestingly some people (myself included) have a genetic variation that means artificial sweeteners don’t work as well (or at all) so things taste even less like they are supposed to because we don’t get the right “sweet” level from it. It’s not just all in my head! I recommend bacon roses. I think she would really appreciate them and almost everyone likes bacon. I’d probably go for the meatballs, too. Dave… Seriously, man, I LOVE panel 4! The detail of her thumb is totally expert! Other than it being a close-up, I see no difference between that panel and how the others were drawn/executed. People around the world eat insects and I know you can get them in the US from a few locations, so what about Chi spiced baked beatles? (she can drink Chi, I believe) Since the Doctor stated that teas are a good way to let her process some non-mean organics…. why not use them to flavor the meats? I’ve had tea boiled eggs before and they are not bad. What about meal worms pureed and served as a gravy over fish? I think her family should be exploring some options to make sure she gets a wide varity of nutrients. I can’t think of mealworms without chuckling at this strip. Thanks man, I lost track of that comic a long time ago and haven’t been able to find it again. Time to binge on a comic night marathon. Chai, I assume you mean? Although chi-infused beetles would also be intriguing! Super awesome power up, yo! (Jimmy Chow reference) But I would caution against consuming any bugs sold commercially. My brother-in-law ate one raw and… got very and violently ill for 4 days. I believe it was salmonella. Makes me wonder if Selkie is immune to such “bugs”. I think your freehand looks great! 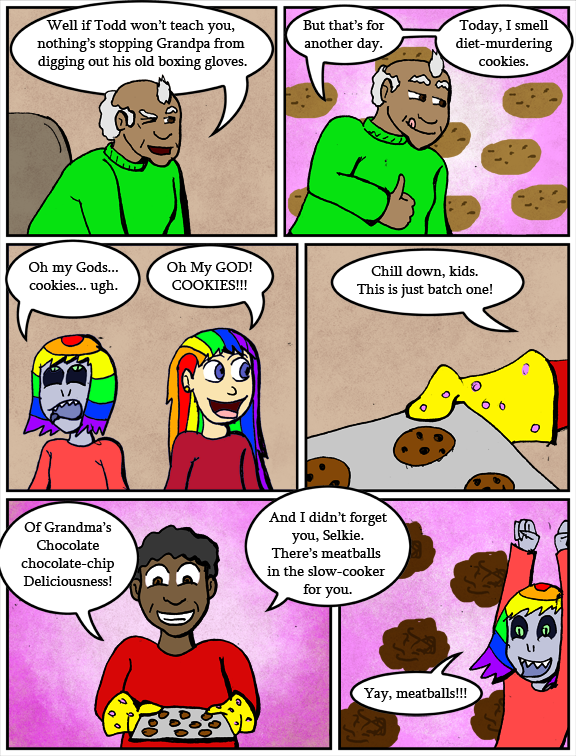 diet-murdering cookies…oh, i know what you mean gramps! i only say: triple-chocolate. with macadamia nuts. deadly, but so worth it! Favorite ice cream (other than daiquiri ice and Girl Scout Samoas): Pecan Praline. I’d swap the grated cheese for thin sliced bacon baked into cups. damn, we need a selkie cookbook. filled with deliscious, all-meat, cheese and fish receipes. yay! Dave, can she eat eggs? I just saw a picture of taco shells made from woven bacon strips. Was just thinking – bacon taco shells filled with a scrambled egg/grated cheese/hamburger/ham mixture. Just posting a quick general answer to the “can Selkie eat this?” questions: Selkie can eat just about anything that comes from an animal. Milk eggs and cheese as well as meat bones and marrow. Selkie can also eat spices and seasonings, but until recently hasn’t developed a taste for them. She can also drink tea, but fruity ones wont taste good to her. Selkie can not eat straight-plants, like fruits vegetables or grains. Most of those would also taste bad to her anyway.